Life’s been a little too heavy lately, so I decided to lighten things up with some fluffy psychoanalysis of a few of my many houseplants. This is the one that plays dead if it doesn’t get watered a few times a week. Even though I feel guilty anytime I come home from work to see the leaves drooped down to the table, this plant is the canary in the coal mine that reminds me to water everything else because it’s the first to complain. Next, we have THE PHOENIX. If ever a plant arose from the ashes, it’s this one. I rescued it at work from an empty office where it had been sitting abandoned for months without any water. 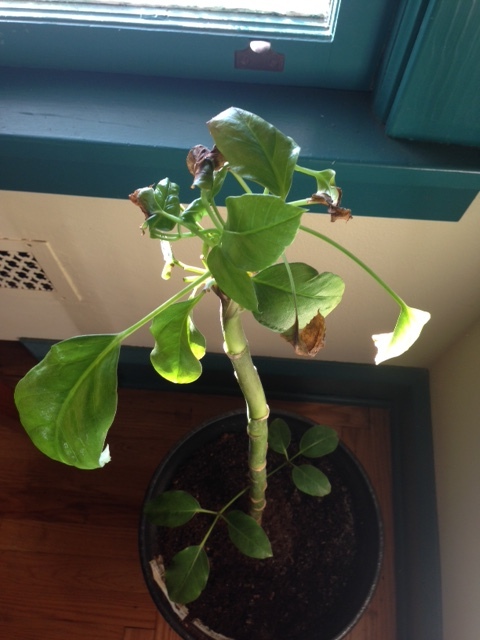 It was down to ONE living leaf. A few years later, this super plant is so voluminous that I can’t even move it because it has many trailing stems of leaves. 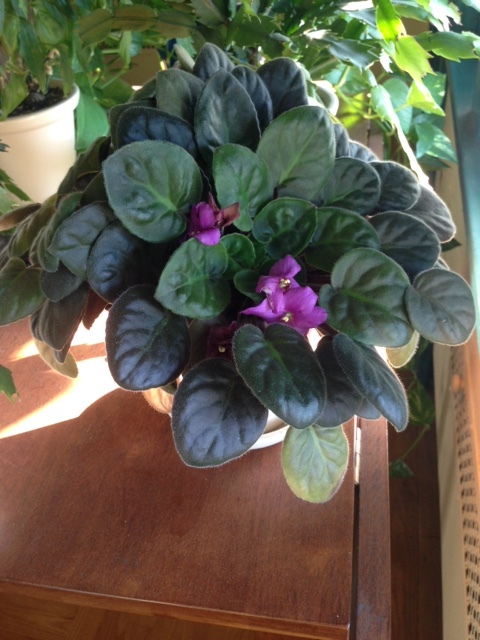 Okay, he’s not 969, but this African violet is fifteen or more years old. I saved this one from my mom (she’s a houseplant killer) when she received it from a friend as a condolence gift after my father died. It survived a family move and has been repotted (only because it fell on the floor and the pot smashed). I don’t even bother to fertilize plants, so I have to give this guy credit for blooming multiple times a year for weeks at a stretch. He’s got good genes. Say hello to the ever-ugly PERSNICKETY. This tree was a gift from my brother and sister-in-law, who have a beautiful, graceful version of the same plant. It’s supposed to be “low maintenance,” and at first it was. I put it in a corner, watered it about twice a month, and generally forgot it was there because it didn’t grow AT ALL. One nice spring day, I thought it would enjoy a little outdoor time. Apparently not. 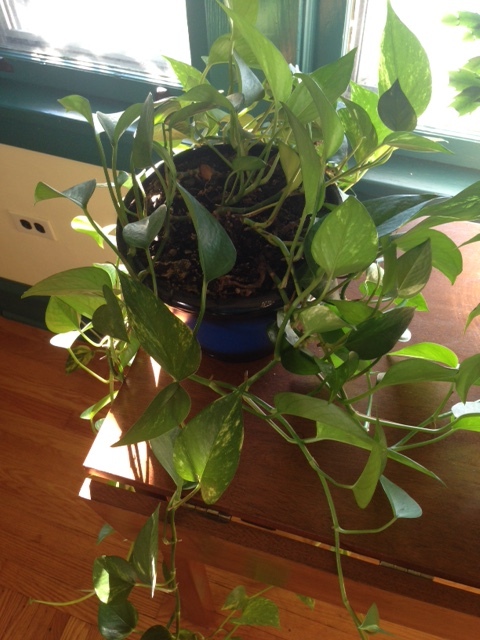 I brought it inside after a day of frolicking in the sun, and the leaves were already starting to turn black. Sunburn? Since then, it’s never been the same. It drops leaves until I think it’s about to die, but I swear it knows when I’m about to throw it in the garbage and has the good sense to sprout a few new leaves to keep me in a state of false hope. This tree is my teacher; I consider myself “above average” in houseplant husbandry, and this is my only failure to date. Oh well; you can’t reach them all, they say. And finally, I SWEAR IT’S REAL, EVEN THOUGH IT LOOKS FAKE. 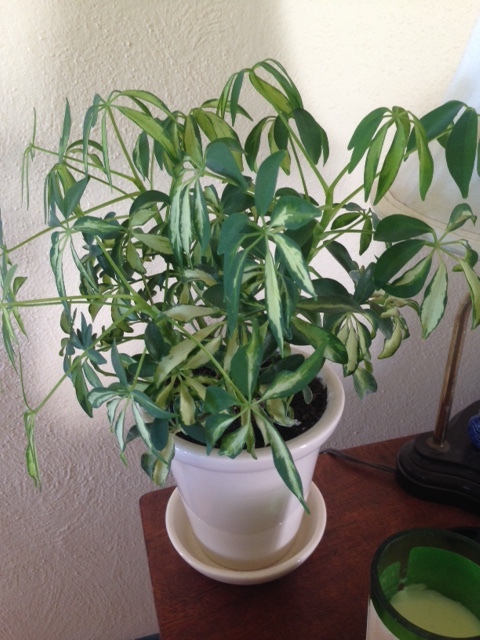 I have had this plant for more than two years now, and in that time, it has never gotten larger, dropped a leaf, or showed signs of distress during periods of drought (i.e., me forgetting it was there and not watering it for a month). 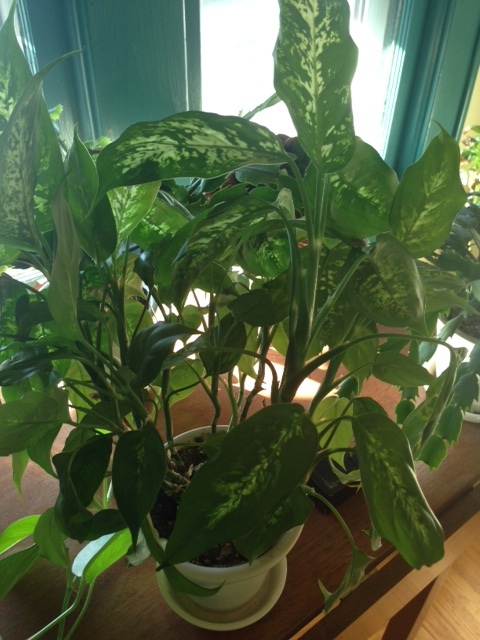 I’d love to see a picture of your favorite (or ugliest) houseplant! The other day, my sons and I were talking about what we would wish for if it would come true instantly. I wished I could sing well. My older son said he wished that whatever he wanted to be good at, he’d be able to do it perfectly right away. You think you’re fooling the genie by wishing for all the wishes you want, but you know it’s going to have to backfire somehow. I said I wished I could sing well because singing is something I’d like to do, but it’s not essential to who I am. Don’t go suggesting I take vocal lessons (I might be pitch deaf for all I know) because I don’t have the drive to practice and put in the hours it would take to improve my singing, even if it were possible. It’s just one of those things that’d be nice, ya know? But writing… that’s super important to me. For most of my life, I told myself that if I could be anything, it would be a writer. There were times I tried to bury that, or work around the edges – proofreading, copy editing, teaching other people to write – because it seemed so precious to me that I was afraid of messing up and losing my only big dream. Why wouldn’t I wish that I could immediately be really good at writing and a big success? Because it would take all the fun out of it. Sometimes writing is really stressful and overwhelming. Sometimes I get discouraged and say, I should give up; this is going nowhere. But some little kernel inside me makes me keep going, no matter what, because when I’m writing and it’s going well, it’s one of the best feelings there is. Experts call it the flow state – where time stops and you are in the moment enjoying yourself. It’s not easy to get into that flow state, but the hours of frustration for those few unexpected moments of flow are SO worth it. I am happy to say that I just finished the manuscript for my second book yesterday. It was more than a year in the making, a few pages at a time. I texted a few people, jumped around, told everyone else I saw for the rest of the day, and then I got back to writing. I don’t want the joy of learning to write taken away. I want to savor each hard-won success as it comes. I want to climb my way up that mountain, scrabbling over every rock, losing my footing a few times, but still holding on tight, until I get to the top. The top is still shrouded in clouds right now. I don’t even know what’s up there yet. Will this be the breakthrough bestseller I’ve been dreaming of all my life? Will it be a movie someday? I sure hope so, but no matter what happens, I’m going to keep writing. Being a parent forces you to constantly be aware of the passage of time. Your life runs to the rhythm of school years and holidays and sports seasons and annual checkups. Parents feel it, and kids feel it too. I don’t know how many times my kids have said they can’t wait for this day or that trip or alternately, that they don’t want summer to be over or to grow up too fast. If you haven’t seen this video about the girl who doesn’t want her baby brother to grow up because he’s just sooo cute, it hits you in two layers. 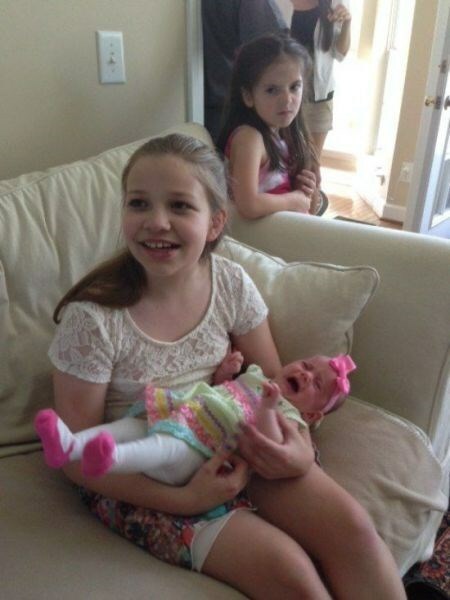 The first is how adorable she is (and she’s right about her baby brother). But there’s also a deeper undercurrent of the pain we share with her of wanting to stop time. I recently read The Power of Now by Eckhart Tolle. Tolle explains the difference between clock time and psychological time. Clock time is what you use to function day to day, to get places on time and do what you need to do. Psychological time is the attachment you feel to the past or the future, anything that is pulling you away from the moment you are in right now. Psychological time can bring suffering because you are either comparing now to the past and finding it lacking, or you feel that you need something in the future to make you happier. The girl who doesn’t want her baby brother to grow up was experiencing the pain of living on psychological time. I see it in my own life as well. I am flooded with old emails that I don’t want to get rid of in case there’s an important memory I’ll lose. I sometimes feel sad when I look at family pictures, even though they are from happy events, because I long to relive them or to be younger (or especially to see my kids be younger again). When we hold on to the past like this, we are depriving ourselves of the opportunity to fully experience the present. By lamenting about how short the summer seems or how quickly a vacation passes, you are robbing the event of its enjoyment by anticipating its end. If you are a planner like I am, you might spend a lot of your present time with your thoughts on the future. People say I’m “organized,” or but it’s really a form of anxiety about things that haven’t happened yet. Since reading Tolle’s book and watching Sadie cry over her baby brother, I am trying to keep re-centering myself in the present moment, to stop dwelling on the past and worrying about the future. I hope that my kids see a difference in my attentiveness toward them and that they too practice living in the now. If you like reading about families, please check out my novel, Giving Myself Away. When did you stop picking up your kids? I am usually a forward-thinking parent. I celebrate all the milestones and enjoy them – my kids taking showers instead of baths, cutting their own fingernails, making their own lunches and beds. But sometimes the whoosh of passing time strikes me so hard that I can’t help but get sentimental about how fast it’s all going. On vacation recently, my son told me he felt sad because he missed his friends. That was the first time he had ever mentioned such a thing and it made me realize he’s making the transition to a point where his friends equal, if not surpass, his parents in his sphere of influence. In this tenderhearted blog by fellow mom Kara Uhl, she wrote about her husband’s lament that there comes a time when you no longer pick up your children. That point passed for me long ago; I’d hurt my back if I even tried to pick up my sons. But sometimes I still grab one or the other of my boys, get as much of them onto my lap as will fit (pretty much just head and shoulders at this point), and talk baby talk to them. They still tolerate my fits of maudlin mushiness and probably secretly enjoy them. Now and then I tease them and tell them they’re not allowed to grow up or get taller, but I know it’s their job to grow up and my job to let them grow up. I am proud of every new accomplishment and often find myself pushing them to try more than they thought themselves capable of doing on their own. I am simultaneously drawn to cuddling my boys and pushing them away, knowing that soon the boundaries of our physical and emotional relationship will change. Other mammals go through the same weaning process that we do, and sometimes the young will live with their mothers for years before striking off on their own. In many animal groups, the female young stay with their mothers their whole lives, while the boys are cast out to find a new family group. Even if I can’t pick up my children in my arms, they still need me to pick them up in other ways. There are days and nights of tears and anger and slights and things to be fearful of. Little problems turn into bigger problems as kids get older. There’s a comfort in knowing that no matter how grown up my kids are, they’ll always need me. The best part of all is knowing that now they pick me up too. 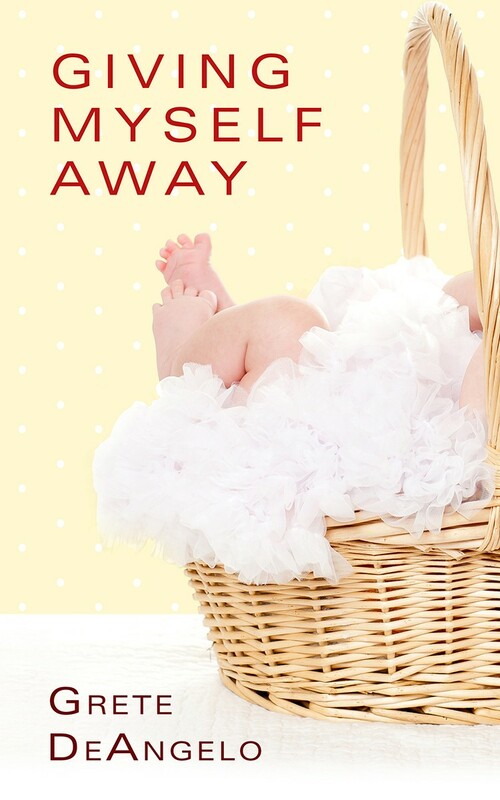 If you like reading about families, please check out my novel Giving Myself Away, available now. I was one of four children, and what that meant is that you had to do something REALLY good or REALLY bad to get any parental attention focused solely on you. Sometimes that was a blessing. I liked not having to be the only one to take the heat when household objects disappeared or got broken. Even though my brothers annoyed me, spied on me, and took things from my room, I liked the feeling of being in a “pack.” Anywhere we went, there was always a pile of us. I rarely spent time alone. An important part of my identity is being a sister. On the other hand, it may have been good to learn early on that I wasn’t the center of the world, but sometimes I wanted to be, and that wasn’t going to happen with three younger siblings. I rarely knew what it was like for the house to be quiet. Sometimes we all got in trouble when my parents didn’t feel like parsing out who did what to whom. At the time, it seemed so unfair, but I find myself doing the same thing when my kids argue now. I try to spend some time with both of my kids separately. I try not to compare them to each other. They may look alike, but they have very different personalities. I even motivate and discipline them differently, based on what works for them. What do you do to handle sibling rivalry in your household? If you’re interested in reading more about family, please check out my novel, Giving Myself Away.